(Photographs taken by Bob & Jenny Thompson, Mick Burgess, Robin Schoolar and Ken Ratcliff). A well attended meeting with a cornucopia of exceptional models kept our reporters very busy. Six new members joined us and we welcomed Jim Gamble as our new President. George conducted the model tour with his usual military precision keeping to time perfectly and taking exactly an hour. 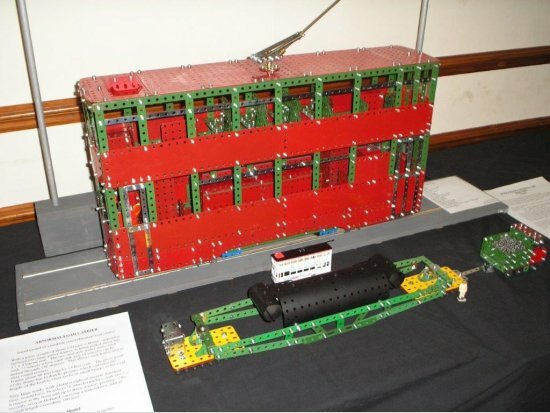 Geoff Devlin showed two interesting and well built models of a Hong Kong Tram No.149 built in very fine red and green Meccano. At a scale of 1:12, a good compromise of size to level of detail has been achieved. The Trolley pole and power cable was an interesting aspect of the model. 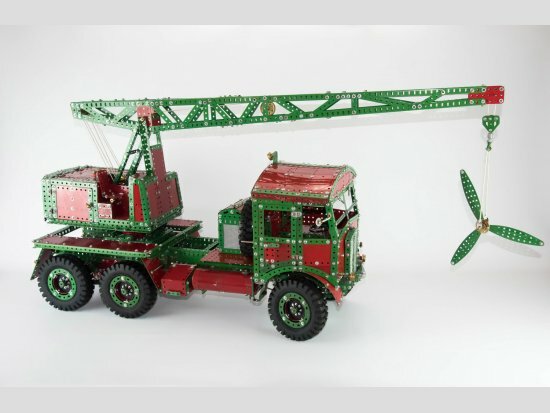 Geoff also showed as Abnormal Load Carrier built with self painted Meccano to a very small scale. 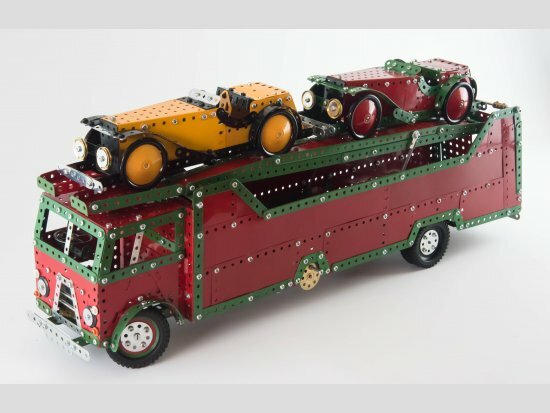 The model was of a low load trailer carrying a Boiler and being pulled by a 2x4 tractor unit with added ballast. The small tractor never the less was quite heavy due to a deceptively large amount of Meccano required to build it. 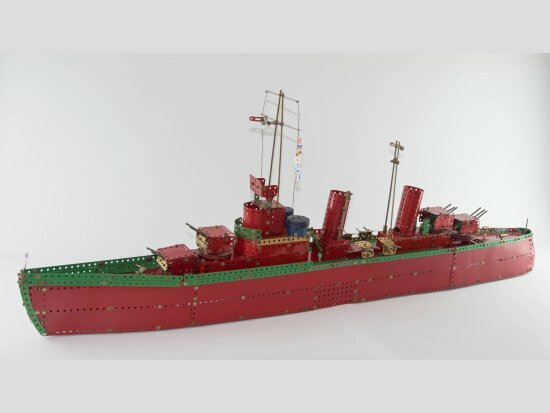 Paul Brecknell showed the Ships Coaling Plant taken from the 1950s Meccano manual set no.7 model (7.25). Built in light red and green. A fine looking model considering it is built with a no.7 set. Peter Evans was showing his Pen-y-Darren steam locomotive for the last time as he intends to dismantle after the show. Peter built this model several years ago and it has always been a fascinating model to watch especially the working valve gear. 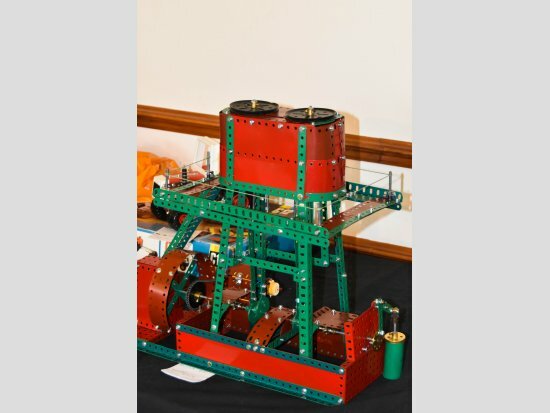 Michael Bent brought along a Twin Cylinder Vertical Marine Steam Engine built in medium red and green and powered by a 6 speed power drive motor. Four triple throw eccentrics are used to operate the valve gear. 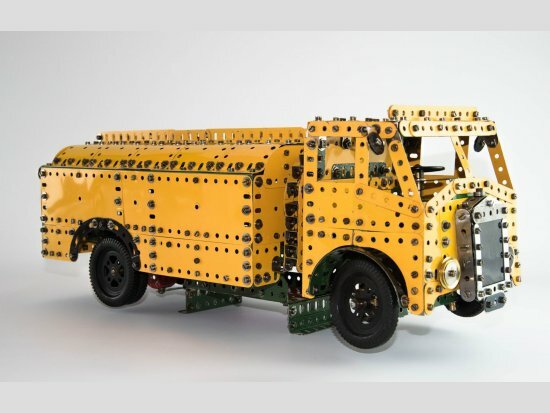 John Bland’s model of an Articulated Tank Lorry is based on a Meccano Magazine article from September 1955. It is built from parts in a no.8 set in medium red/green. John has modified the steering from the original design. 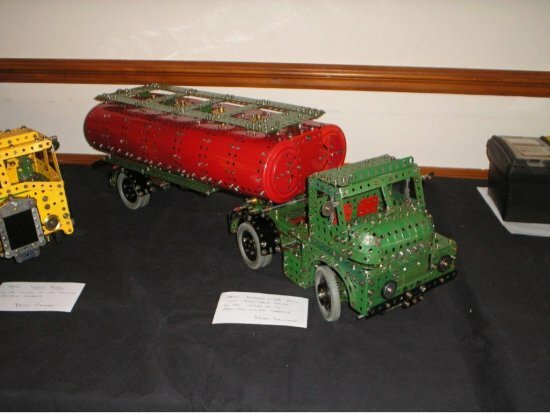 Terry Pettitt showed a model of a Fowler/Field Marshall Tractor built in red and zinc finish. This is a beautifully built model packing a lot of mechanisms into a relatively small space. 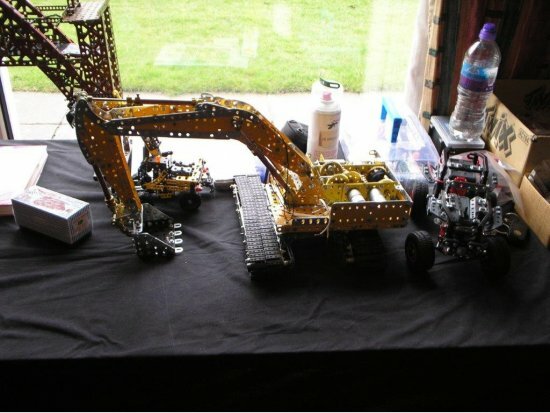 A while back this model used Meccano caterpillar tracks and worked very well. The track has now been changed to improve realism. The tractor has a working 3 speed and reverse drive with high/low ratio also included. Brian Edwards showed two tanker lorries. The Albion built in yellow Meccano was attractive and different as this type of model is so often built in the old favourite red and green. The other being a Bedford S-Type Petrol Tanker (Shell-Mex). 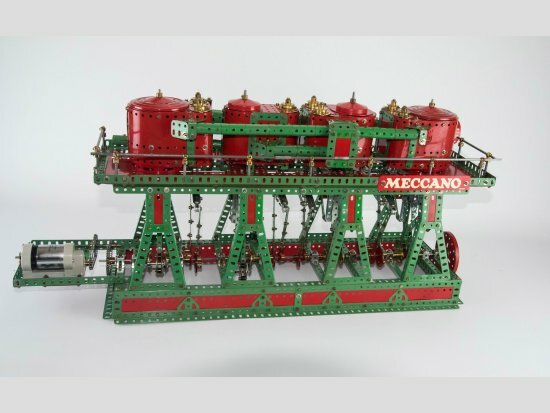 The model was built is red and green Meccano and had two interesting points. The use of Thrust Bearing Flanged Discs to form the ends of the tank and a very attractive curved bonnet formed in rolled green strips and reminiscent of the front of the Green Goddess. 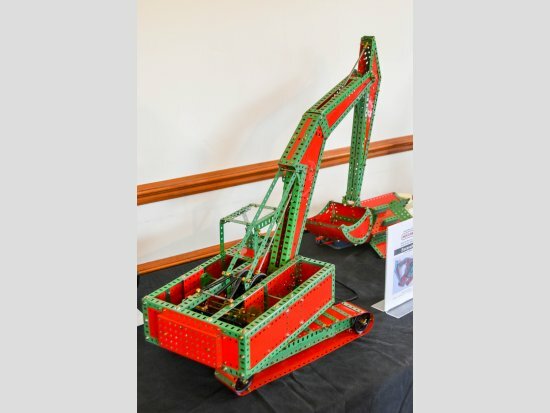 Tom McCallum showed his Mechanical Digger again in pristine light red and green which was built for Atlas Aircraft and used in the 1990 Meccano brochure and on Trade stands. 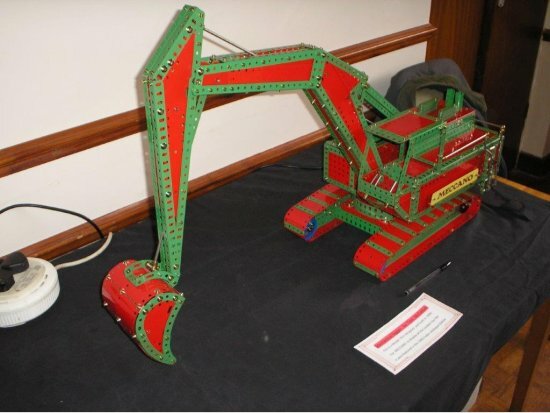 Roger Marriott has taken the Mechanical Digger built by Tom McCallum (following model) and produced a similar model along with a Meccano Model Plan MMP237. 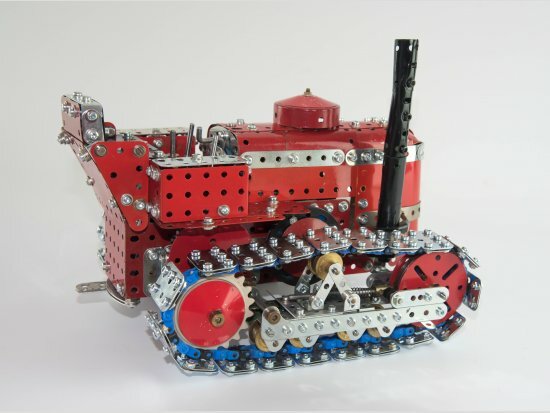 Beautifully built in light red and green, this model uses a 20v motor and has working Bucket, Arm and Slew actions. The model has an ‘Auto Mode’ that can be selected for demonstration purposes and is designed to be built with a set 10. 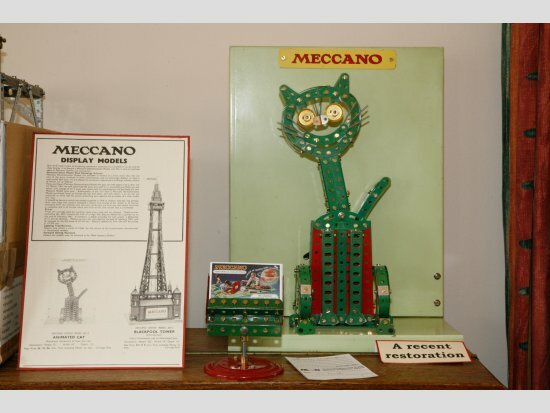 Jim Gamble showed a Meccano Dealer Display Model of a nodding cat which has been renovated to beautiful condition by Jim. Mike Edkins, who thanks to his daughter’s taxi was able to get to the meeting from Devon, showed his Long Case Clock which is amazingly built with only a no.9 set (plus some extra nuts and bolts). This clock based on Geoff Wright’s original runs for 30 hours and keeps good time. This model has it’s own model plan no. 235. Matt Goodman showed an Adjustable PCB Rotator built to securely hold a printed circuit board while working on it. Manual adjustments included a roll round facility so both the front and the rear sides of the card can viewed. Crocodile clips are used to hold the card. George Sayell had two models which are both still under construction. 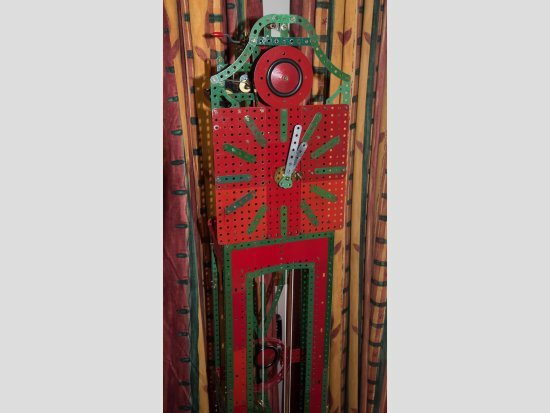 A ‘Sayell-Heath Robinson’ Differential Analyser in red and green Meccano which is intended to calculate the area under a curve. George has plans to further improve this model over the summer. 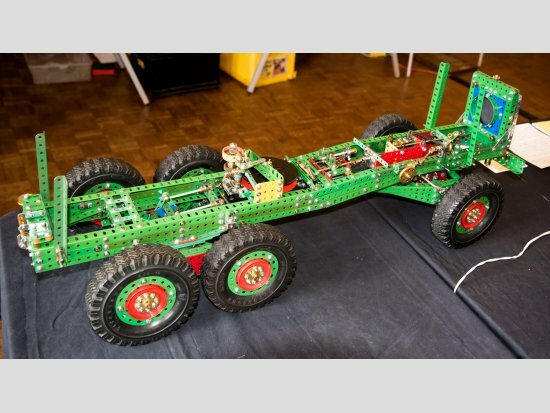 Also a Bus Chassis with radio controlled steering and speed control. The chassis is of light weight construction and includes a diff on the drive axle. It will be interesting to see this model when completed. 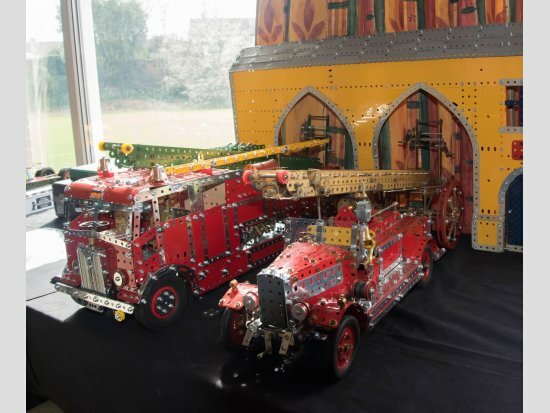 Two superb Fire Engines parked outside a Fire Station were shown by George Illingworth. The first was a 1934 Leyland FK1 built in red/zinc with gold ladders. The other was a 1951 AEC Regent London type with 3 sets of ladders which included hook ladders for going up the side of sky scrapers. Both models are built to 1:12 scale and have an incredible amount of detail. The Fire Station was a two arch frontage built with yellow Meccano. 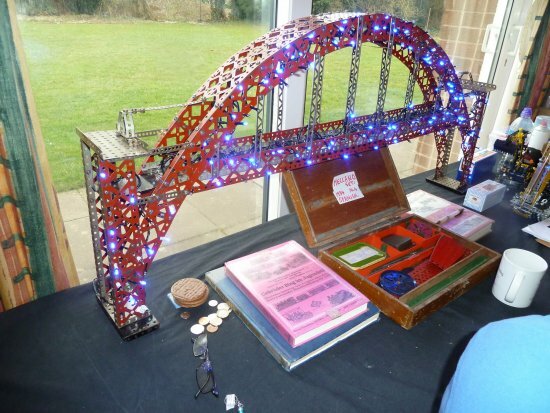 Colin Reid showed a model of the Tyne Arch Bridge built with Erector parts and at about a 4 foot span. Christmas fairy light included. Colin also showed a 1934 set no.4 Meccano set with wooden box. Mark Rolston showed a couple of Mechanical Excavators. 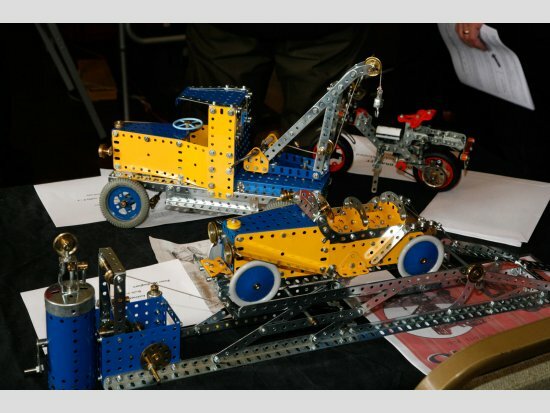 The small one is a Meccano France model while the larger one is based on the model plan 222. Mark also showed a Spin Master 4x4 Buggy. 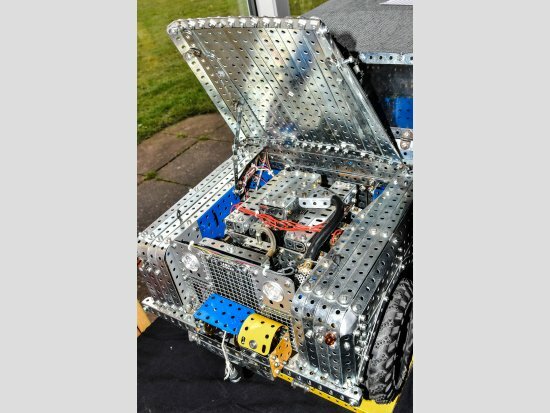 Christopher Dove showed his wonderful large Landrover built with zinc strips. A trailer is now included. A clever 4 speed and reverse gearbox with synchromesh was showed. I forgot to ask Chris if this was going to be fitted in the Landrover. A Chinese style cart/rickshaw and horse designed by Konkoly is always a pleasure to see. 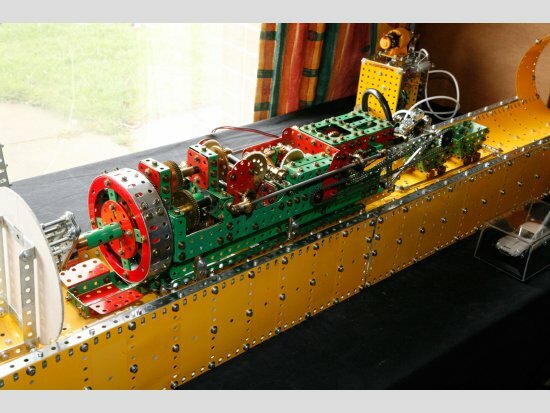 Howard Somerville had a very interesting model of the Beaumont-English Tunnel Boring Machine from the 1880s. The first mechanised attempt to tunnel under the English Channel managed about 1 mile from each coast. Howard has built this model from the only available original drawings known to exist so some guess work has been necessary. Howard’s model looks entirely feasible representation of a remarkable early TBM. Clive Kingston showed us an impressive model of HMS Belfast, which he visited in London three years ago. 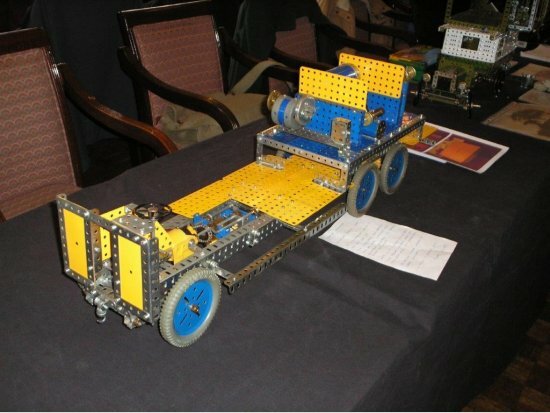 Clive chose to use standard Meccano axles to represent the gun barrels and this set the scale for the whole model, which was constructed very cleanly using R&G parts. Terry Wilkes has a very interesting model coming together – the 1940’s model 10.9 ‘Mobile Workshop’. 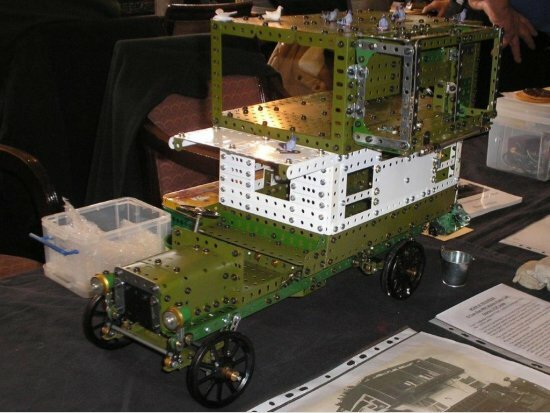 George Illingworth had provided Terry with images of a prototype used by the US Army Air Force which was remarkably like the Meccano plan and so the model is being slightly altered to reflect this (for example, it now sports LHD). 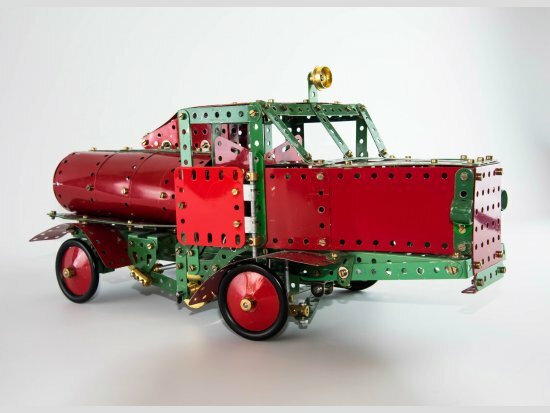 Terry found that the Meccano instructions were not only vague (which we are all used to) but also misleading and is convinced that images of two differently constructed models are used in the same plan, thus requiring the builder to be especially quick-witted! We now expect to see something a little different from John Reid and his current model is no exception. During WW1 many Type B buses (‘Old Bill Buses’) were sent to the front line by the London Omnibus Company but just a few of these were converted to serve as mobile pigeon lofts for the (very important) messenger pigeons. The model is close to completion and features many clever features and comes complete with resident pigeons. This prompted a lively debate around how ‘homing pigeons’ would know where to return to; given that their ‘home’ was by definition mobile? 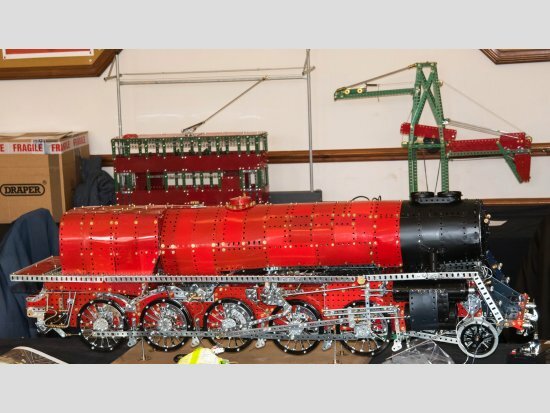 Colin Bull is constructing a large scale model of the Evening Star 2-10-0 locomotive. This has been loosely based on Model Plan 76 by Paul Joachim (the Franco-Crosti Locomotive) but with a great deal of freelance work, especially around the running gear. Everything works smoothly, with all wheels turning and Colin hopes to have this detailed model completed for Skegex. A huge trailer was the subject for John Molden’s current model, in dark R&G parts. 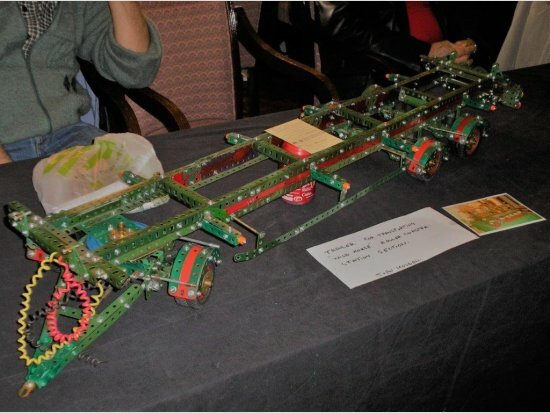 This is built to transport a large section of the ‘Wild Mouse’ model fairground ride and has a steering front axle and an effective handbrake acting on the two rear axles. 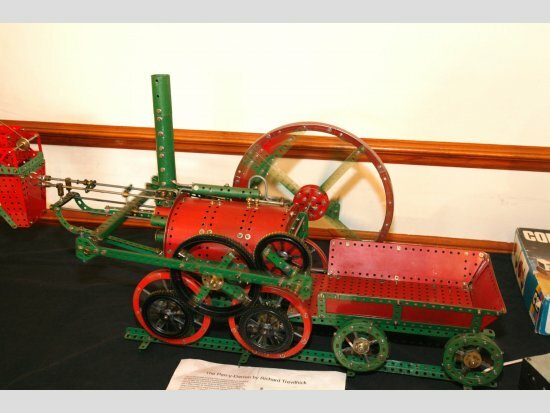 Very cleanly modelled also in R&G parts was a 1900’s Suffolk Punch steam tractor, built by Dave Phillips. 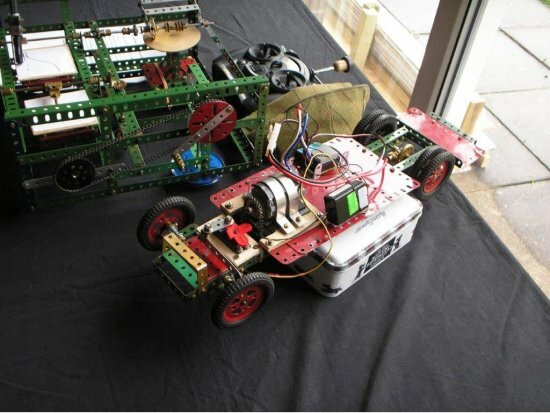 The model was driven by a small non-Meccano motor and ran very smoothly indeed. Ken Senar has been inspired by the Musgrave (non-dead centre) Mill Engine which he has seen at the Mill Engine Museum in Bolton. The prototype was originally designed as a marine engine, which is immediately apparent but then adapted to operate in a large textile mill. The model uses an attractive combination of R&G and YBZ parts and features a very impressive built-up flywheel. Dave Bradley kept it simple this time, with a 1/6 scale electric moped. This freelance design used an eclectic mix of parts to very good effect. Peter Hardingham displayed two models. First was the ‘Car Lifting Apparatus’ from the 1935 F-L outfit but built in YBZ parts. This featured a working scissor lift and a smart sports car. Peter’s second model was again in YBZ and again from the same period – the Motor Breakdown Crane. 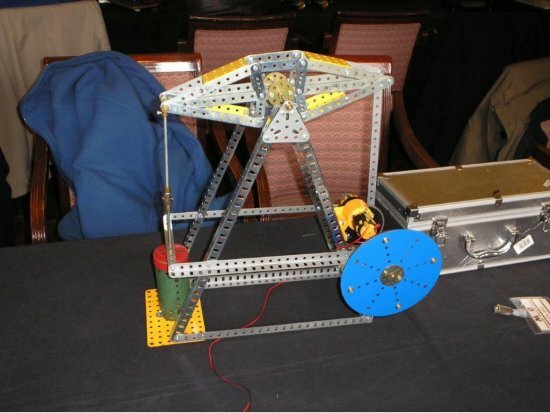 This model featured a simple but charming design with slewing and hoisting actions nicely represented. Roger Burton showed a very clever synchronous clock which ran absolutely perfectly all day. 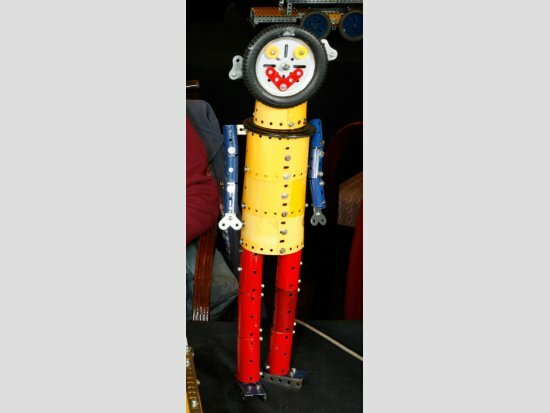 This was closely based on a design by Richard Bingham and described in the June 1986 Sheffield Meccano Guild Newsletter. 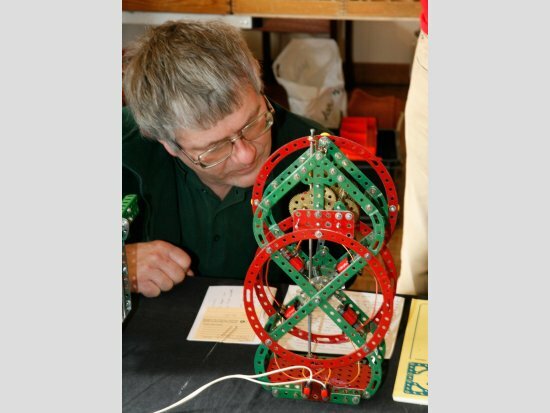 Roger explained that building the frame and gearing was “The easy bit” compared to getting the clock to run continuously and to keep good time. When starting, this type of motor must be rotated by hand at roughly the right speed (750 rpm) so that it can ‘lock-on’ to the 50 hertz of UK mains electricity. Geoff Burgess delighted us with two large lorries, both in R&G and both using 6” tyres to set the scale. First was the chassis of a Leyland Martian 6WD featuring a host of mechanical features, not least of which were a two-stage 12 speed gearbox and powered winch. Geoff’s second model was a very impressive AEC Matador with Coles crane. Again this model featured 6WD, with one motor driving the lorry itself and three more in the crane. This large model operated very well indeed. Robin Schoolar is another modeller who likes to build ‘something a little bit different’ and this time he showed us a fascinating ‘Torque Amplifier’ based on an earlier model by Alan Partridge. 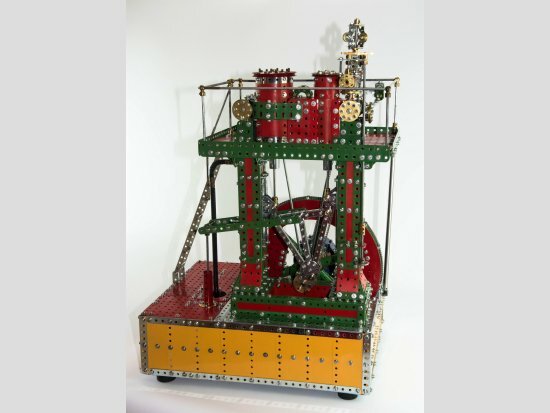 This could perhaps be described as ‘power assistance’ because turning a handle to manually lift a weight brought into play a motor which used a pair of worm drives to assist you in lifting that weight – all very clever and mesmerising to operate. 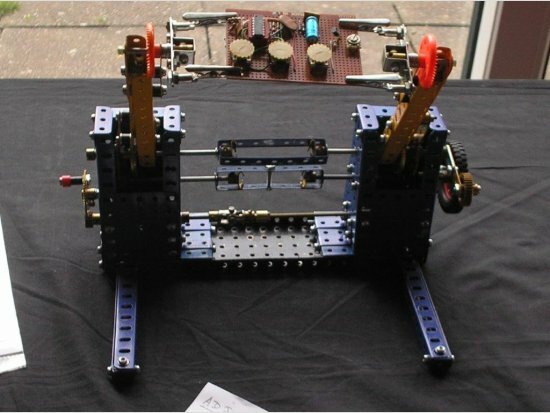 Carl Gill brought along a simple beam engine which ran very well using a Meccano 6-speed motor. 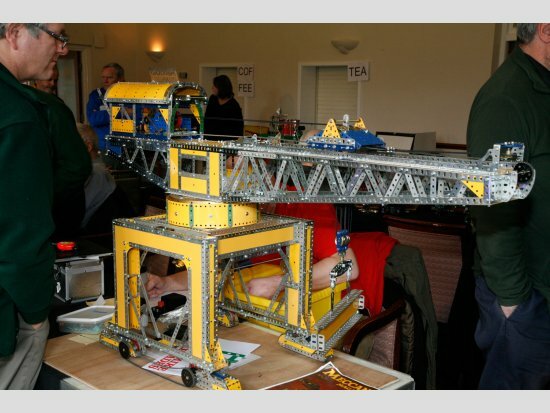 A large and impressive model from Richard Howard was the Electric Dockyard Crane designed by the late Bert Love and described in Meccano Magazine in 1978. 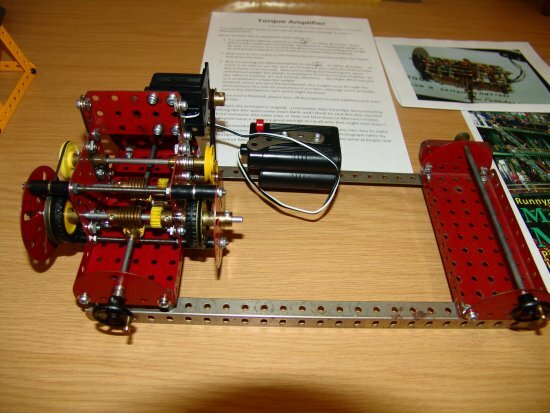 Constructed in YBZ parts and driven by multiple Meccano 6-speed motors, this was a very nice model indeed and capable of being built using a standard Set Ten. Mei Jones showed us a very tidy car transporter in R&G parts from the Set 8 manual and with some small improvements. This model carried two sports cars based on model 4.4 from 1947 and 4.17 from 1951. Mei had also constructed a very tidy motor tricycle delivery van (model 4.22 from 1948). This model originally used a No1 clockwork motor but has been converted by Mei to electric power and now has working suspension. Mei first built this model in 1949! 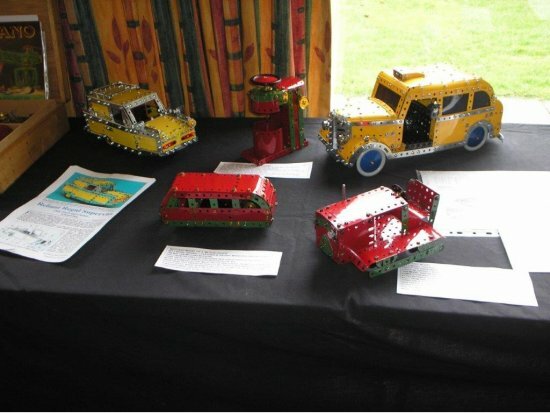 Sid Beckett has been making some models in response to requests from local youngsters. He has a biplane, rotating ballerinas and a Meccano Man. 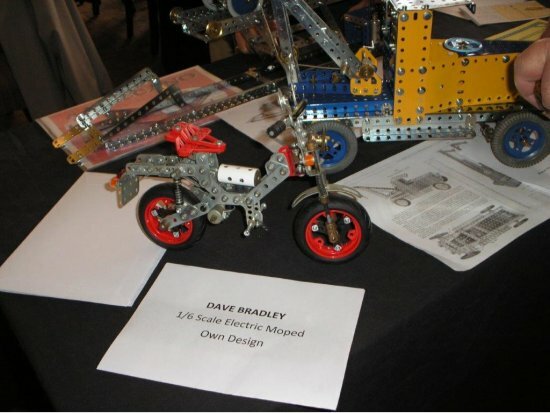 Sid explained that the local children will regularly ask him to build something and of course, Meccano is always up to the challenge! A great ‘exhibition model’ was presented by Paul Merrick in the shape of an ‘Automated Table Tennis Ball Complex’ based closely upon a model shown in CQ (March 1997). Balls are raised by the pithead lift, dropped into a chute and passed to the delivery tower. From here they pass into a truck on rails, which tips each ball into another chute allowing it to roll back towards the pithead lift, in order to start over again. Paul explained that modern ping-pong balls are 2mm larger in diameter than those used with the original model and that this gave him some headaches when trying to get everything running smoothly. Paul has made several changes and employs an Arduino microcontroller rather than the original electro-mechanical approach (with the Arduino storing the ‘programme steps’ without the need for an accompanying laptop). This complex model ran perfectly all day. Trevor Batten brought along the Road Sweeper (model 8.17) is rarely seen but is an interesting and busy design. Whether the vehicle is “Charmingly quirky” or an “Ugly duckling” was debated, with its long bonnet bringing to mind continental lorry designs; but either way, it was great to see. Mike Cook showed us a very impressive model of one of the pair of triple-expansion steam engines which were used by the White Star Line in each of the Titanic, Majestic, Olympic and Britannic ocean liners. 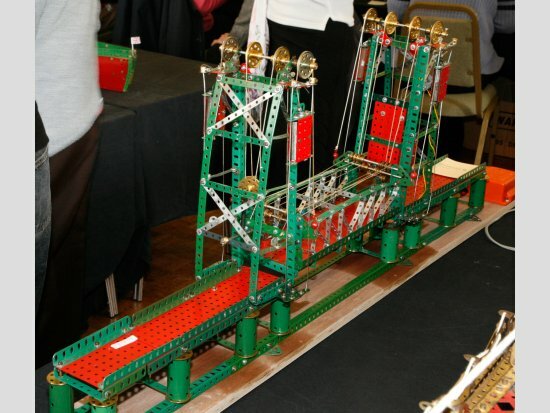 The scale is approximately 1/30 and the model was very cleanly constructed in R&G Meccano. 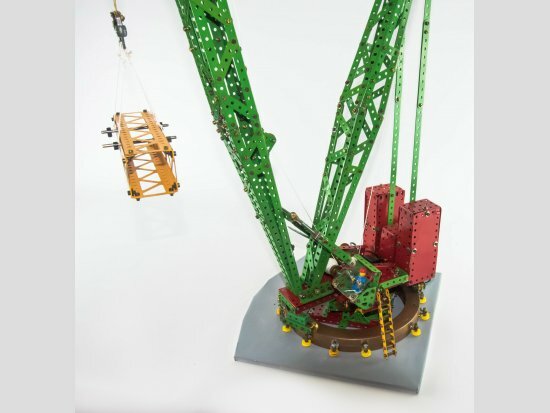 Tony Horton demonstrated his Manitowoc Crane, built to 1/50 scale. Like many of the models on show, this one crammed in a tremendous amount of detail and technical features. 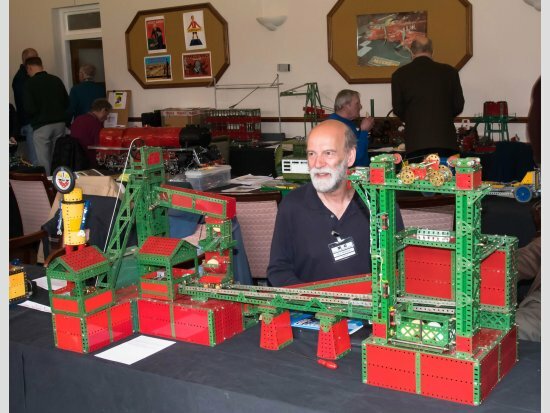 A tidy lifting bridge (for sale!) was brought along by Alan Scargill. 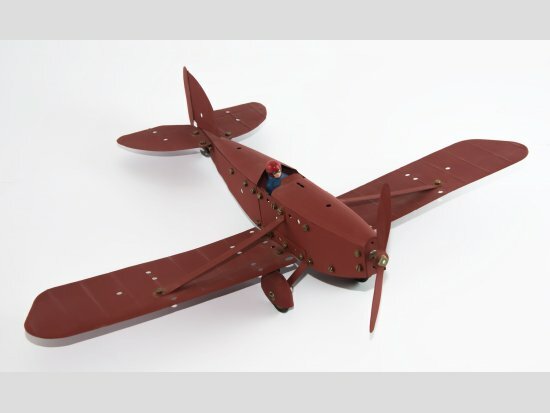 Neil Bedford showed an Aeroplane Constructor monoplane. Currently in red primer, this one has been salvaged from very rough parts and is awaiting a full respray. The pilot figure was made by Neil from modelling resin using a cast which he made from a real Aeroplane Constructor pilot. 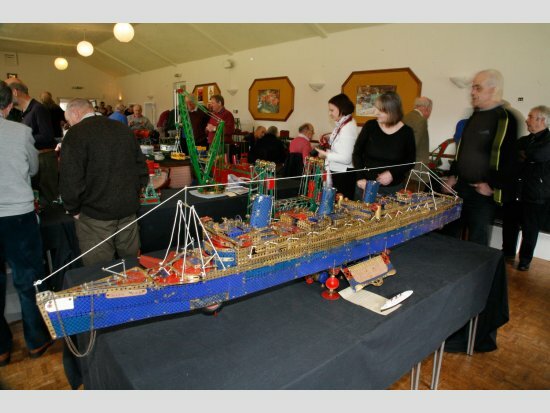 Stephen Wilson has used a tremendous quantity of Blue and Gold parts to construct an 8’ long model of the Queen Mary Liner. Stephen explained that the Queen Mary is now a floating museum at Longbeach, California and he certainly captured it very effectively with this freelance model built roughly to 1/120 scale. 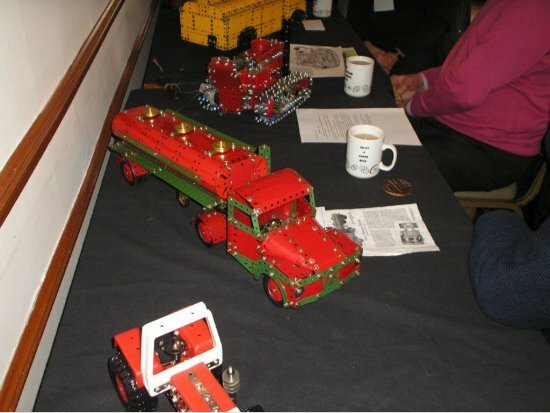 Mick Burgess showed an excellent variety of models including a Reliant Regal Van (from a Bernard Perier design), a yellow/black Taxi from the 7.11 1954 manual, a Motor Coach from the May 1956 MM, a Tractor from a 1954 manual and finally a Mixing Machine from the Sept 1953 MM. Finally Bob Thompson displayed something different. 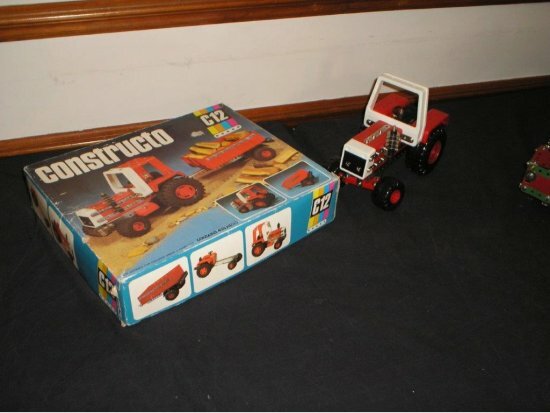 It was a Constructo C12 Tractor set from originally East Germany under the Communist regime utilizing a 10mm spacing compared with Meccano’s ½” system. This company continued after the fall of the wall and later became Eitech.